Maryam Maquillage: Spring Breeze Pleez! Go GREEN & save our mother earth! P. P. S. Don't forget to check out my guest post on Makeup-and-Macaroons!!! ohh lovely mint colour! I am at 104 now uggh! Cute little daisies! I love that! thanks guys, sinful colors rule!!! Your nails are always so pretty! I am going to have to try some of your styles! I'll tag you if I post on my site! :) Have a good weekend! the turquoise color is really nice on you! have a fab weekend! I feel your pain! It was 50 celcius IN MY HOUSE yesterday. No A/C, nothin. The nails are looking on point as always, hope you're managing to beat the heat. Great message at the end, Go Green! :) I really like flower detailing, super cute! I love the eyeshadow!How many colours you used? 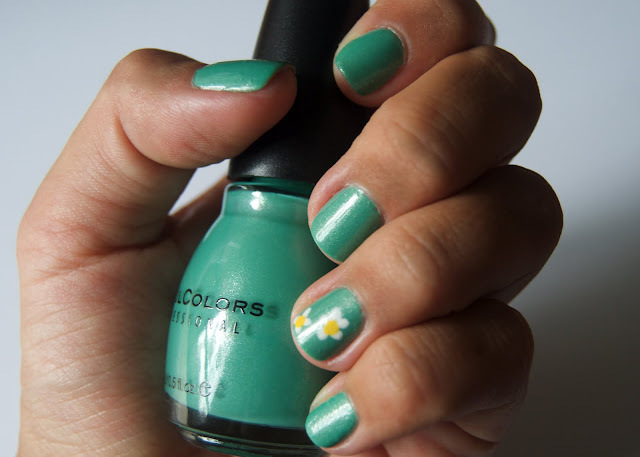 I have the same nail polish green shade and love it! @ta: thanks girl, the beach has been my savior!! !